I enjoyed Dark Naga's first Kickstarter release, The Lost Temple of Forgotten Evil which was released for 5e / OSR. It was simply a strong adventure release, regardless of system. Dark Naga's latest Kickstarter is Confronting Hastur for 5th Edition. As I type this, the project is just $173 short of its 2k goal for funding. 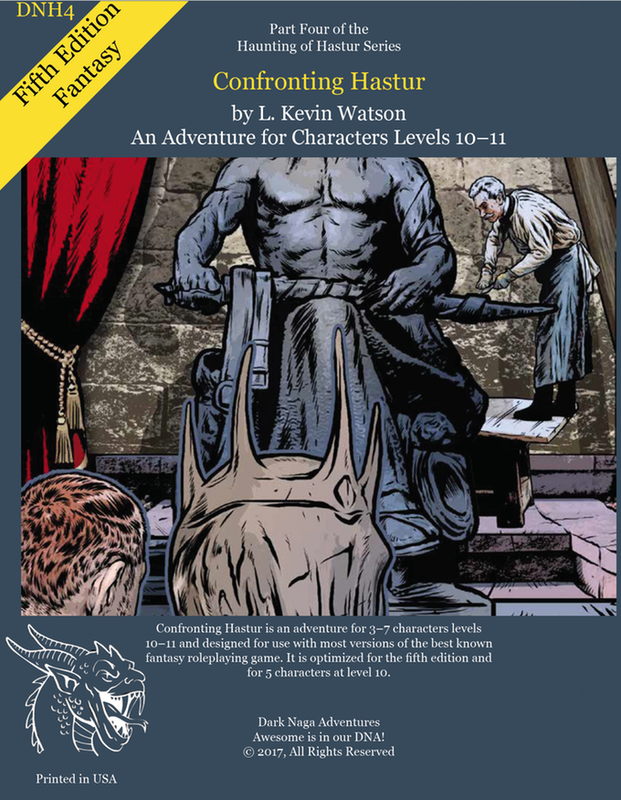 If it hits 5k, we get an OSR edition in digital (and Pathfinder too for those that care. I think 5k is well within reach. Digital buy in is 10 bucks, print is 20 bucks. That cover alone is enough to summon Him. What is that thing in the front? It looks like someone dumped pancake batter over Sauron. It's the unfinished head. See the cover of "The Lost Temple of Forgotten Evil" for what the statue would look like finished. I actually have (and like) that module...thanks for the tip! If the OSR version doesn't fund, when all five are done, I will either do an OSR print run of all five as individual modules or a HB omnibus edition in color.